I’ve somehow managed to squeeze in some time to create some new silver charm designs amongst the craziness of running the hedgehog hospital. I just love these new tiny heart pawprint and hedgehog. All my silver charms are handmade by me in solid silver and I hand sand and polish each one. All these silver charms can come on Pandora charm holders to hang from any Pandora or Pandora style bracelet. I can also supply them on a different style of bracelet if you prefer. My collection of handmade solid silver wildlife charms. I can even personalise your charm with a name or initials on the back. As well as wildlife charms, I also make solid silver pebble charms. I grew up by the seaside and a gorgeous pebble beach and so they are inspired by my childhood. Each one is inset with a real birthstone gemstone. The challenge is choosing which one – they are all such glorious colours! If you are looking for a gift that can grow in future then I can even supply a Pandora style silver bracelet to which more charms can be added in future. A lovely gift idea! All of my silver jewellery comes gift boxed with a postcard of a rescue hedgehog and information about helping hedgehogs. All the proceeds support my hedgehog hospital so it really is a gift that gives back. 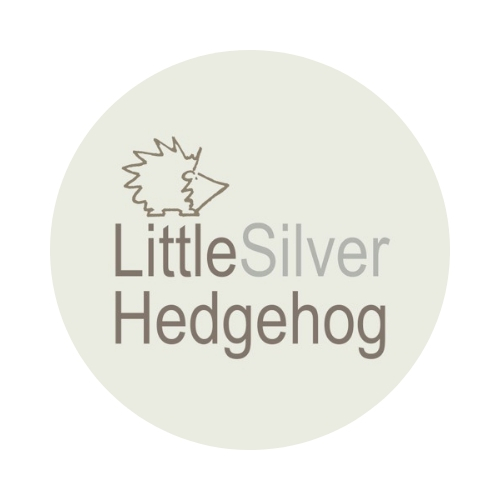 To view my handmade silver charm collection, please visit my Little Silver Hedgehog Jewellery Shop. I run a hedgehog rescue in York. My work is entirely self funded. You can find out more about my work here and also how to support it.